Attractive pub with a fantastic view of Corfe Castle. Food pricey but very good. Rather dull choice of four 'best bitter' type ales with Dorset Jurassic being the most interesting so had local cider instead. Friendly service. Came here for a bite to eat last night. 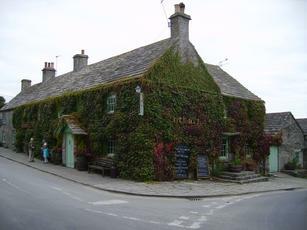 The pub is set on multiple levels and its large garden has nice views down to Corfe Castle. Ales were Jurassic Vanilla & Bourbon Portland Porter, Otter Bitter, Ringwood Best & Thwaites Wainwright. Ciders were Purbeck Cider Company Dorset Dabinett & Joe's Dry, Lulworth Skipper Medium & Dry & Westons Old Rosie, Country Perry & Cider Twist Raspberry. Food was also quite nice. I much prefer the Square & Compass, nearer the coast. But this pub is well worth a try too. The last review is 100% accurate especially regarding the service. I wondered if it was because we were hot and sweaty walkers only seeking a pint and crisps - but obviously not. Beers on offer were Sixpenny IPA, Dorset Brewing's Jurassic, Ringwood Best and Downton Quadhop and the ciders/perry were the local Lulworth Skipper, Cider by Rosie and Joe's Cider as well as Weston's Stowford Press/Twist/Country Perry/Old Rosie. As the views of Corfe Castle from the beer garden are so fantastic, I forgave the indifferent welcome in this rabbit warren of a pub. The view is truly wonderful, and a fine reward for making it to the top of Kingston Hill on a bike. Parking's a bit thin on the ground. The beer is mostly from small breweries now, and generally well kept and in good condition. Unfortunately, the staff leans toward terse and self-important, while the beer is by far the priciest in the area. Stop for a good pint and the view, but don't expect a whole lot of appreciation for your custom.